Custom: Putting shoes on a tree. 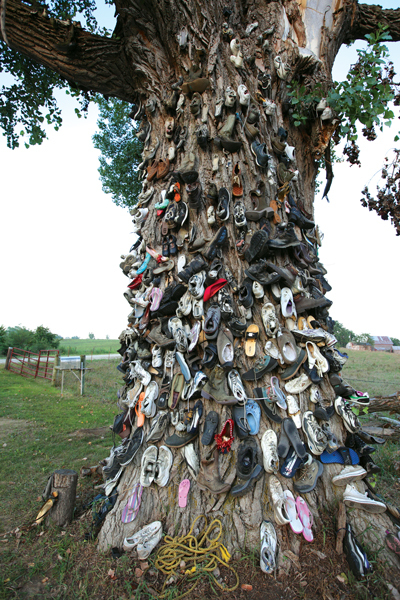 Where to see the result: The Kissel Shoe Tree near Wetmore. From Wetmore, go 1 mile west on K-9, then 5 miles north on W Road (blacktop) to the old Davis Ranch sign, then 1 mile west on 80th to V Road.The tree is at the corner on public ground. Sometime in the 1970s, John Kissel read an article in some farm magazine about a guy in another rural state who had a shoe tree. 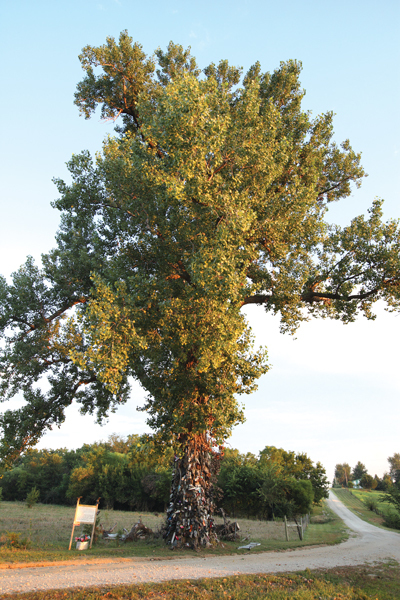 The idea kept with him and in the late 1980s he started putting shoes on a cottonwood just north of his farm. In 1909, when his grandfather moved to the farm just west of the tree, it had the circumference of a telephone pole. Now it measures about twenty-three feet at the trunk. John remembers playing under it as a boy while he waited for the mail carrier to come. People are invited to nail shoes on the tree or tie the shoe laces together and throw them over a branch. In fact, there is a can of nails and a hammer at the base of the tree. All sorts of creativity is shown with how people affix the shoes to the tree. 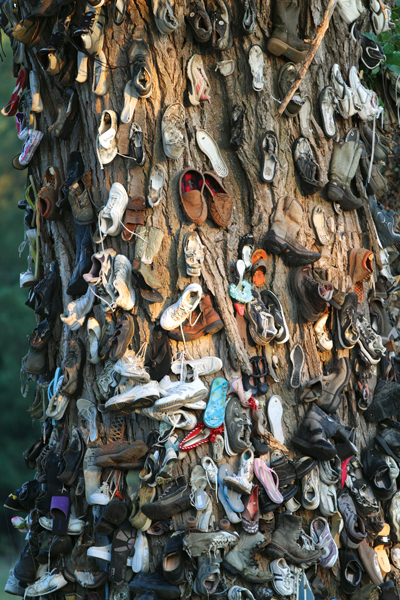 Often times people sign the shoes so the Kissels know that people from several states have put shoes on the tree. Not everyone adds shoes to the tree. Some people just want to come see it and there is no doubt that they'll be telling their friends about it. It's a one of a kind place. In fact, it's such an unusual sight that it's even inspired songs and odes! How soleful are your branches. The only one in Kansas! By Kansas Explorer #4214 Erika Nelson. We came upon thee on the corner in Nemaha. Nay, this is a sturdy Kansas tree that soon will hold our shoes. To offer opportunity to hammer, hang, or loop a shoe. To leave behind a part of our identity. To know a piece of us is fastened to the earth. We gave it our all, for we are Kansas Explorers! Sometimes we nailed them for another. On this cold day, we mattered to each other. On the old Shoe Tree, on the corner in Nemaha. after an Explorer trip to the Shoe Tree in January 2007. Clyde, the bus driver, never forgot his journey taking dozens of Kansas Explorers on rural dirt roads on a snowy January day to nail shoes on the infamous Shoe Tree!